Join the discussion on our forums! Come discuss Crystology over in our dedicated Crystology discussion topic. "The Light is neither a particle nor a wave. It's more of a juice, really." so tell me... is it worth keeping? im not sure there's many cards with 1-attack that worth 2 mana, and they actually not summoned but to hands. For sure. Pulls lynessa, prelate, kanger, stonehill etc..
so can't play it in ODD paladin :(. You draw them to your hand, they aren't summoned. Yeah pulling your Stonehill Defender, Tar Creeper or Righteous Protector seems like a good deal for 2 mana. This is such an awesome card, for how versatile it is. 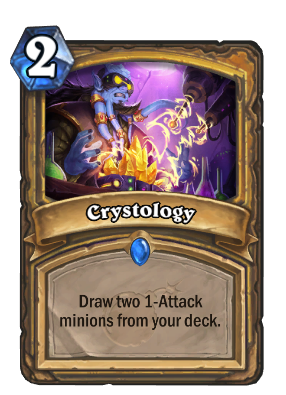 Pretty sure this wont work with Lynessa, she casts targeted spells, not all spells. Unless her text is misleading. Unless you mean to draw her, then it is very good. Really great card that will be playable in all paladin archetypes. Aggro will benefit the most unfortunately but control still can make it work and that is wonderful! Can pull Righteous Protector, Tar Creeper, Stonehill Defender and other cards that we don't know if they are meta yet like Faithful Lumi. Paladin is one of the few if only classes that can get proper value out of this card draw specification. 2 mana draw Tar Creeper. 2 mana draw Lynessa Sunsorrow + Bolvar, Fireblood ? I mean i would run something else with 1 attack too. You might have one of stonehills in hand already.